Autocar has an impressive scoop – some very nice shots of the front quarter of Gordon Murray’s upcoming T.25 city car. 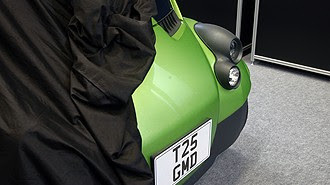 With its black plastic bug eyes and castellated lower windscreen, the tiny part of the green T.25 we can see looks very little like Car Magazine’s speculative renderings from October 2008. Which is good, because Car’s images showed a rather characterless egg - not what we’d hope for from a designer of Murray’s calibre. Autocar’s article also sheds light on the brand names that Murray has registered as potential trademarks. As exclusively revealed by GreenMotor.co.uk in January, Murray plans to use the names iStream, iFrame and iCentre. We had assumed that iStream might be the production name of the T.25 car, but according to Autocar it is instead the moniker of Murray’s innovative manufacturing system. We suspect, therefore, that iFrame refers to the structure of the car, and iCentre may refer to the assembly plant design rather than, as we speculated, service centres or dealers. Murray does have one left-over trademark, which might still make a name for the car: i2. According to Autocar, a driveable prototype is weeks away. No doubt snappers from the trade press will be loitering in the vicinity of Murray’s Surrey offices in the coming days, hoping to snap a shot of a T.25 in black plastic disguise.